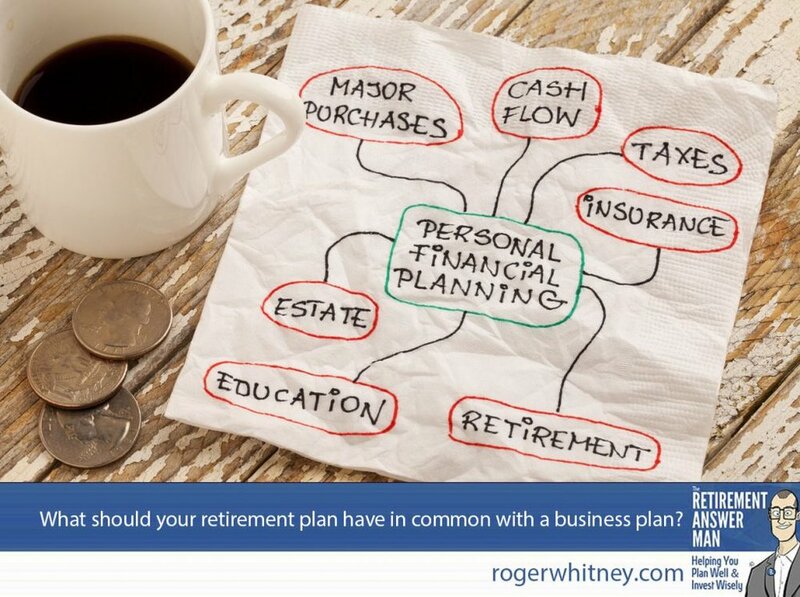 Your retirement plan and your business plan should have 6 things in common...ish. personal financial planning concept - napkin doodle with espresso coffee cup and coins on a grunge wooden table. A lot of business school revolves around creating a written business plan. Similarly, many financial planners working with clients spend a ton of time and effort developing a complex retirement plan. Traditionally, both of these are thick documents that show estimated costs under a variety of circumstances. Both documents guess at the future with limited information provided by the present. Investment and credit factors: I help people see past their debt and their investments to a life they want to live in retirement. Aiding people to decide how to invest their money and get beyond debt moving into retirement is something I work with a lot of people to improve. Health risks and other life considerations to take into account: You have to plan for the unexpected. But do through the lens of what you know. I work with clients through little conversations to coax out of them the risks they could face in retirement. You know, the things you don’t want to think about; you can’t paint your retirement plan by numbers. I also help people understand their investments, expected returns, adjustments for inflation, and other considerations. Market risks, government risks, and other factors: Episode 163 of my podcast, for instance, looked at whether or not the Trump presidency’s positive effect on the economy—“the Trump Bump”—will continue or become the “Trump Dump.” Beyond market forces like that, government rules and regulations are constantly changing, and it’s my job to know the rules so you don’t have to. Cashflow management for your ideal lifestyle: Cashflow problems can sink even the tightest business model. Don’t let it sink your retirement. A financial planner with your best interests at heart can help you plan for cashflow contingencies, both expected and unplanned. After I’ve signed clients up, hammered out our negotiations, and committed to walking their life with them into retirement, I like to tell them a little story. These clients are often living in million-dollar homes, so this kind of undermines their confidence in me. I do that on purpose. You know what? If everything bad happens at once—a market downturn, you get Alzheimer’s, your wife has cancer, you’re overspending, horrible returns, high inflation—then no amount of planning will make your perfect lifestyle come true if you stick to your original plan. If you get avalanched while climbing a mountain, you darn well better change your plan right then and there to getting out of the avalanche before you resume climbing. Same goes with life. Avalanches happen, and you need to know to adjust for them. This is the final lesson I want you to learn from business. In the startup world, one of the largest buzzwords is “pivot.” If you set your business up in one category, but market forces, consumer demand, and even your gut instinct tell you that something else will work better, you need to be prepared to make that shift. Overconfidence in your retirement plan is absurd, no matter how good it was when you first got it. But here’s what I tell clients, and what I want to tell you now. You can be super intentional about managing change and have the right little conversations to adjust along the way. If the markets tank, everyone will suffer for it. But if you are attentive and agile, you’ll be one of the last ones to have to adjust your desired lifestyle because of the little adjustments you made along the way. That way, it’s not going to feel like a big deal to be in a trailer home, because your peers may just be even worse off if they clung to their original plans. That way is as outmoded as a 1972 Karmann Ghia. Be prepared to pivot in your retirement plans. That’s how you can Rock Retirement. When did you have to pivot in business, and how could you compare that to you coming retirement?